This is not meant to be a bike rack, but it serves. 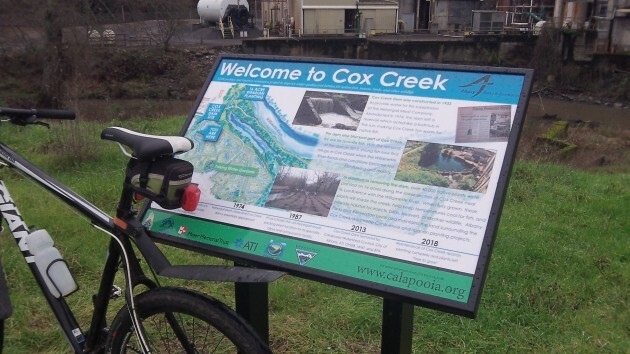 A new feature has appeared on the Cox Creek Path, one of Albany’s bike and walking trails, and an interesting item it is. It’s a sign, as you can see, and it details the history of the building the passerby sees across the creek, as well as recent conservation efforts on the creek and in the vicinity. The building used to be the Nebergall Meat Co., started in the 1930s, which built a small dam on the creek to store water for fire fighting. The plant closed in the 1970s. Now the building houses part of ATI Wah Chang, the metals company. The Calapooia Watershed Council and others have demolished the dam to improve the creek as fish habitat. 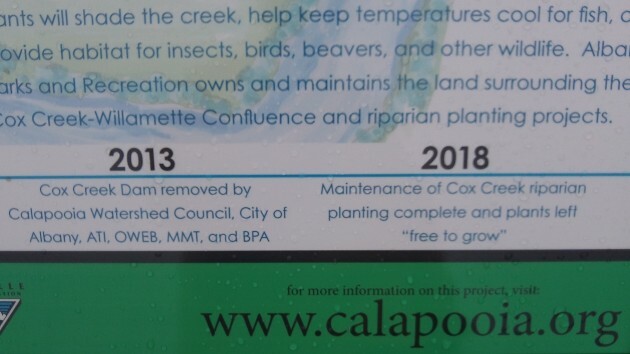 They’ve also restored native plants in a large area near where the creek flows into the Willamette River. You can read all the details on the this elaborate sign, which appeared as if by magic between Monday, the last time had passed by there, and Thursday afternoon. To my surprise, farther toward Salem Avenue the path on Thursday was still partially blocked by the branches of a tree that fell the previous week. I would have guessed the parks crew would have cleared it away by now. Conservation projects are listed along with their approximate dates.